Poker is the most popular card game played worldwide and Texas Hold'em Poker is the most popular version of Poker played. This then raises the historical questions of "Where did Texas Hold'em come from?”; what is the "History of Poker?" and finally what is the "History of Texas Hold'em Poker?". To answer this complex question with four words…"no one really knows,” all we can do is speculate how this game came to be. Before we can begin getting into the history and the creation of Texas Hold'em Poker we need to understand the history of poker, more specifically, how the game "Poker" evolved. There are many theories on this topic because people tend to have differences of opinions when it comes to the history of Poker, or better yet, the origins of Poker. The primary reason is because there seems to be no clear evidence of a predecessor of the game. Furthermore, it is more likely that the ingredients of Poker derived from many different historical card games. There is, however, an agreement amongst the different theories, which is its basic principle; the birth of Poker is a very old one. The origin of the word Poker is also a well-debated topic. 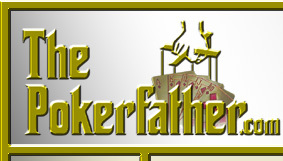 There are as many variations regarding the possible birthplace of Poker as there are of the game itself. A popular belief is that Poker started forming in China around 900 A.D. Even though cards, as we know them, had not emerged yet. The Chinese had the game dominoes, which had not only been developed in this era, but also was becoming very popular. It is written that Emperor Mu Tsung introduced the game of "domino cards" to his wife in 969 A.D. which could have been the embryo of Poker's slow-growing birth. Our next moment in time brings us to Egypt. Even though the nature of the Egyptian card games remain buried, remnants of cards have been recovered and have been dated back as far as the 12th or 13th century. Furthermore, the remaining cards pieces can be linked to cards used for the eastern origin "Ganjifa" ("Treasure-cards") in the early 16th century. Some propose that modern cards originated from the Indian card game of Ganjifa. The Ganjifa card deck consisted of 96 elegantly painted cards which were used in a variety of betting games that were played. The highly stylized cards may have helped pave the way to the Persian game of "As Nas,"
As Nas is a game that consists of five players which requires a special 25 card deck that has 5 suits. This game has a meted deal, has betting rounds, and has hierarchical hand rankings. This game has the most resemblance to the game of Poker; however, As Nas only dates back to the 17th century. The most popular etymological root for Poker comes from the French game "Poque”. Poque was a card game that involved bluffing and betting. In addition, it is stated to be the first card game that used a deck of cards which had Spades, Hearts, Clubs and Diamonds. Furthermore, the French were one of the most avid nations for card playing during the early 15th century. The English may not have been known as a card playing nation until the latter half of the 15th century; however, the British have been recognized for their innovation for a number of early card games, which include: Primero, Brag, and Faro. It has been said that these games are some of the first known "casino style” games where an uncertain number of players (called ‘punters’) would bet against a single dealer (call a ‘Banker’). Poque was also a pioneer of another pre-poker card game, a German game, called "Pochspiel” which translates into "knock-play". This game resembles Poker in a number of ways. Firstly, its name is derived from the fact that at one stage of the game the player, in turn, declares the state of their hand by either passing or opening. Those who pass, signify it by saying, ‘Ich poche,’ or ‘Ich poch.’ This was sometimes shown by knocking on the table with one’s knuckles. Finally, this game also introduced the tactic of bluffing into the early stages of the betting world. Poker may possibly come, indirectly, from the Danish word pokker, signifying the devil. And lets not forget gambling is considered a sin in some religions! 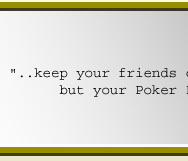 Another possible explanation for the word Poker could have been copied from and underworld slang word "poke”. Back in the days when card games were played on the Mississippi River Boats this was a term used by pickpockets. Cardsharps (an expert in cheating at cards) used a deck of 20-card and played a game, which was formed on the bases of cheating, against contestants ("suckers’) in the street to alleviate them from their "poke” or "wager”. The cardsharps may have added the ‘r’ to make it "Poker” and use the word amongst themselves hoping their victims make not pick up on the change in the slang word. With so many claims to the name, the chance of narrowing down on the exact birthplace of the History of Poker is parallel to the chance of hitting a Royal Flush! Any one of these earlier games, or a combination of them, could have easily been the egg that Poker hatched from. However, with regards to Poker’s distinct North American concept, it seems that the French were the most influential gamblers in the Colonial New World. In the early 17th century the French colonials arrived in Canada, with them they brought their beloved ‘poque’ card game. The game, however, did not become popular until the beginning of the early 18th century in New Orleans. Furthermore, it was French-Canadian settlers who planted the population seed of the blossoming town New Orleans. To help pass time during the Civil War, poque was played by many of the soldiers. It was here where the first different versions of Poker arose from. There were many soldiers all in different locations across North America playing a game called Poque. Versions such as "Stud” or "Draw”, which are predecessors to present day Poker, emerged during this time period. It has been argued that the proper game Poker took its first breath during this chaotic time period in America. However, the game did not receive the Poker title until 1834. 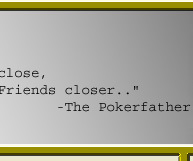 The name Poker was awarded to the game by gambler named Green. Jonathan H. Green learned how to play cards when he was a young man in a Cincinnati Penitentiary where he had been imprisoned for petty crimes. After his release he went to the Mississippi River, debatably the busiest gambling region of the period. It is here where he started his career as a professional card player and where he first came into contact with the many versions of poque. In his writing he refers to the many versions of poque as "the Cheating Game", which indicates these games could have been developed by the cardsharps. "The Cheating Game" quickly gained popularity over a former cardsharp game called the 3-card monte primarily because the new game was perceived by the players to be more challenging and honest. Green was very intrigued by this new game and discovered that there was no definition in the American Hoyle (dictionary) or, for that matter, in any other documentation of his time. Jonathan H. Green then took it upon himself to officially name and document the 'Cheating Game' in his book as "An Exposure of the Arts and Miseries of Gambling: Poker”. Since its birth, Poker has multiplied, changed forms, and has spread across the globe like a transmittable virus. It has been crowned the most popular played card game in world. There are many forms of Poker that is played and the popularity between each form has also changed. The first crown was worn by the game 5 card draw or stud. This game rose from relative obscurity during the time of the American Civil War to dominate the Poker scene for almost a century. Next was the game 7 card stud. This game took over the throne prior to the Second World War and wore the crown for approximately forty years. 7 card stud’s popularity was, however, aided by the booming Nevada gaming industry during the 50’s and 60’s. Presently, Texas Hold’em Poker is the Royal Flush of all Poker games and has been ever since the 1970’s! As previously mentioned, "no one really knows” where Texas Hold'em came from. There is no precise information in regards to where the first game of Texas Hold’em Poker was played. However, according to legend, the earliest game played was in Robstown - Texas, in the early 1900s and it first came to Dallas - Texas, in 1925. Today, it is unquestionably the most commonly played Poker game anywhere. Players are not only passionate about playing the game itself, but also are enthusiastic to access the immeasurable collection of educational resources in order to improve their game skills as well. Texas Hold'em Poker gained its popularity from the World Series of Poker Tournament. The World Series of Poker has been held annually ever since its opening date in 1970 at the Horseshoe in Downtown Las Vegas. Every year since then, more and more Texas Hold'em Poker Tournaments have developed on a global scale, and even more and more people are all trying to get in on the action. As the millennium past and the internet industry grew, players and viewers all over the world no longer have to be in Las Vegas, Nevada to enjoy the excitement of Texas Hold'em Poker. Modern day technology has given players the ability and resources to access ring or tournament games at virtually any point on the globe. So whether you are sitting at a table in the luxurious Monte Carlo Casino in France, or using your cell phone to play while on a ski lift in Whistler - Canada, or an astronaut downloading ThePokerClub software on the International Space Station, everyone everywhere now has a the ability to claim their name in the game of fame – Texas Hold'em Poker!